Why I Read Dracula – my books. my life. 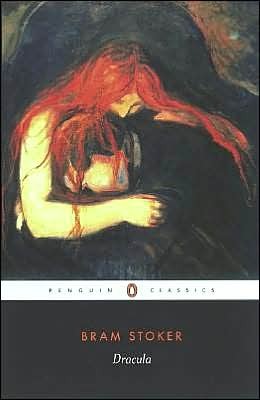 Instead of doing a “review” of Dracula where I tell you about the plot and my thoughts and we discuss the already-discussed-to-death novel’s interpretation of conservative Victorian culture, gender, and religion, I thought I would simply explain why I read Dracula and if it lived up to my expectations. We are overrun with vampires today, from Twilight to True Blood, and I thought it was time I understood where these stories came from. Yes, I understand Stoker didn’t invent vampires and the Vampire myth, in various forms, has been around for ages in many cultures. Yet, I think it is fair to say Bram Stoker’s creation of Count Dracula and the mythology surrounding it has had the biggest influence on our common understanding of what a vampire is. Because of this, I expected to find the “traditional” vampire in Count Dracula – none of this sparkling nonsense. I wanted the night-loving creature who drinks blood, sleeps in coffins, cowers from crucifixes and garlic, cannot survive in sunlight, and is defeated with a stake through the heart. However, it turns out that Stoker’s original Dracula isn’t exactly this vampire. The drinking blood, crucifix, garlic part is alright, but Dracula is fine in sunlight (though weakened during the day), must rest in his native soil, and is eventually defeated with two simple knives (although vampire-Lucy is defeated with a stake through the heart). He can also shift into other animals besides the bat and he cannot pass running water. It seems the various movie adaptations of Stoker’s story (which contain at least the sunlight bit) have managed to shape our understanding of vampires as much as the original novel. And today, with the competing mythologies of the various vampire books, television shows, and movies, perhaps we have new understanding of “vampire” and my classic vampire idea doesn’t exist anymore. I love that people have taken the vampire myth and made it their own, but I certainly hope people 100 years from now don’t picture Edward as the quintessential vampire. Yes, I read and enjoyed Twilight for what is it, but I’ll take Count Dracula for the standard thank you very much. Even if this notion is quite accurate. For some reason I thought this book would be rather quaint but it was actually deliciously creepy. I was surprised by how much I enjoyed it! And you’re right, even the traditional image of Dracula doesn’t match the book – it is fascinating how much was added/taken away in the movie adaptations. I loved how creepy it was. I don’t do scary very well, but creepy I like. I read Dracula years ago and I found it quite cheepy in places but found the diary entrys at the beginning quite boring to read. I read Dracula probably more than five years ago. Because of this, I think many of the modern vampire descriptions–like in Twilight–might have skewed what information I retained from Dracula. Am I correct in remembering that in Dracula it takes a series of vampire bites to become a full-out vampire? I think it was three bites. Anyway, if I’m remembering this correctly, it surprised me greatly. I thought it was a one-bite thing–much like modern vampire descriptions. But then, in Dracula, they never address how a person can be bit and not die. Twilight addresses that issue by showing that a bite will not kill–only if a vampire continues feeding on the human will the human die. I think in Dracula, the person has to drink the vampire blood to become a vampire. They found Mina drinking Dracula’s. I don’t understand not liking Buffy. 😉 I’m still not sure I really like True Blood. I may give it up. The vampires have blood? That seems odd. But familiar. Maybe that’s why I found the process to becoming a vampire so strange. It’s definitely not like the process of Twilight. I actually don’t remember as much of Dracula as I wish I did, and have been meaning to read it again! But what I do remember, I think, is the creepiness of the guy who ate bugs, or spiders, or all kinds of little critters, and somehow related to Dracula himself. I think he eats more of them as the novel goes on. I also remember how whenever someone needed blood, they’d just totally whip out their little transfusion kit and give/take no matter what. My word, unless they were super lucky, half of them would be dead! Yeah – the fly and spider guy (Renfield) was creepy. I love how creepy the entire book was. I think Lucy must have had type AB blood. Otherwise there is a pretty good chance that one of those transfusions would have killed her. I love Dracula. It is literally the story that started my life-long vampire obsession. There is something so deliciously creepy yet extremely sensual about the entire book. From what I understand, people have always been taking the vampire myth and making it their own. No two vampire stories are alike. From as far back as the Greek and Roman times, there were stories of blood suckers, but they were as different from Stoker’s Count Dracula as Edward and Stefan are from each other. I think this is ultimately what is so intriguing about the mythology – it can be all encompassing and no one story is right or wrong. In the end, they are all pretty damn cool. I’ve read Dracula a few years ago during a trip in Scotland and I quite enjoyed it. I really loved this gloomy atmosphere Stroker depicted !